Sometimes you find yourself being a tourist in your own city. Yesterday after work, I got caught up on the crowded Circle Line on my way to the Tate Modern, along with the hoards of Olympic Ceremony goers making their way to the Stadium. 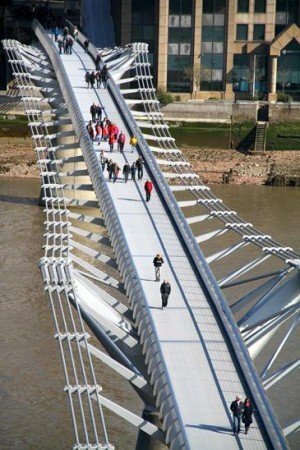 After I surfaced from London’s underground, I walked across the now affectionately called Wobbly Bridge, that was thronging with people from far flung places. We all found ourselves suddenly immersed in unexpected stereo sounds: single words and sentences booming from big speakers hanging over the bridge cables, resonating like a wall of deep sound. Having gotten a little tired of our mayor, Boris, chirping all week his heartfelt recorded message ‘Get Ahead of the Games’ – on the buses, trains and in the station concourses – I found this unexpected 3D soundfield, suffused with our pattering feet, delightful. I discovered later that it was called Tales from the Bridge and created by Martyn Ware (founder of The Human League) in collaboration with the poet Mario Petrucci. Lines of poems and strings of local anecdotes about the life and times of London ran and rang alongside us as we strode forth across the Thames. They did not stream together as a coherent narrative but faded and overlapped, acting as emotive heart-string pullers. I was transported back to being much younger, vividly being reminded of special times when I had gone to see a Shakespeare play outdoors at Regent’s Park and a trip to the Museum of London. This jolting of childhood memories was a refreshing change, making me focus on the potency of words rather than having to navigate my way through the visual overload of garish Olympic mascots, banners and flags. From the accompanying website, it suggests it will “immerse the listener in an oasis of peace and contemplation, half-remembered dreams and thoughts, of meditation and learning.” Indeed, instead of worrying about something at work I drifted back in time. I eventually met up with Rafael at the Tate where we stumbled into one of its latest installations located in the bowels of their massive oil tanks. 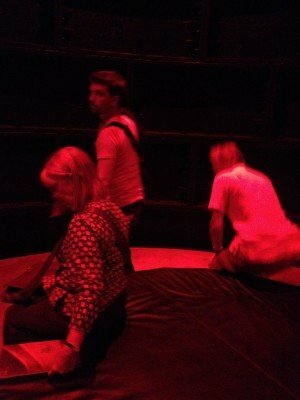 The first darkened enclosed room we went into had just a hanging microphone that emanated with powerful 360 degree voices. Again, my ears were seduced by a singular form of audio art. I sat and just listened. Appreciating art through sound is ephemeral. But such momentariness triggers visceral emotions and memories in such a sharp shard way. I wanted to linger in the moment in quite different ways to being immersed when looking at visual art. Back in the underground we heard several buskers, strumming and singing in the echoing tunnels. Again, it took me back in time to when I first heard those songs. Such is the magic of a tune when walked into an unfamiliar context but very memorable time. Hearing the city, augmented with mellifluous voices and sweet sounds, is such an arresting contrast to the “cha, chee, chee, cha, boo, booom” we hear so often and resent so much leaking out of our fellow commuter’s ear buds. While city dwellers enjoy their personal playlists reverberating through their inner worlds, serrendipitous street-shared sonics pervading our cities are, in my mind, infinitely more pleasurable for all. “I’m not in love. So don’t forget it. It is just a silly phase I’m going through. 10cc’s mid 1970s ethereal song reminds me of long gone summers. To top the day, I caught a snippet of it when walking past a store. And even now, it continues to hit a sweet spot: melancholic, romantic, and full of teenage-angst.